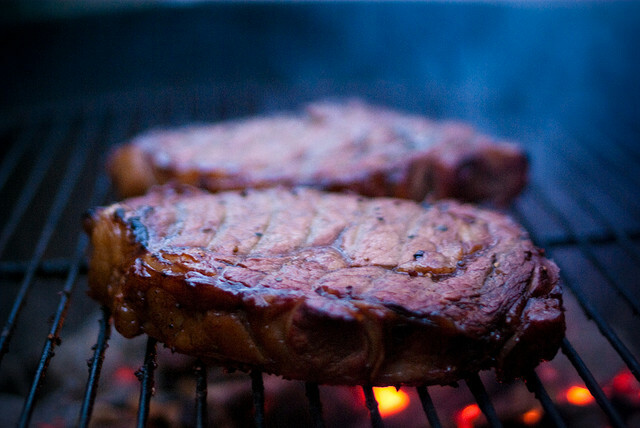 There are few foods that elicit the passion that a good steak can. There are even fewer foods that can have their apparent quality “raised” by proper preparation and spices. Add in the number of different cuts of meat, hundreds of cooking methods, and proper steak preparation can practically become a religion upon itself. Every good cook has their own preparation style, my personal favorite is pretty simple but I’m not above shamelessly using someone else’s style. Celebrity Chef Alton Brown has two great styles, grilled “with out the grill“, and his more famous “Cast Iron Steak” recipe. Another popular cooking style was published in Cooks Illustrated Magazine. But what really makes steak good is the seasonings, or in many cases, the lack of seasonings. Most cooks like to go with the basic, salt, pepper and “garlic if you really need it,” seasonings. Especially if the quality of meat is excellent in the first place. But if you want to mix it up a little, or have a cheaper cut of meat you’d like to fancy up a bit here are some great options. *Note; cooking instructions have been left out for each recipe. Feel free to use one of the great ideas above. Just substitute the following ingredients. Each recipe below assumes 1 1/2 to two pounds of meat. Comment below with your favorite steak seasoning recipe! “Generous amounts” of Kosher Salt – use more then you think nesseccary. Salt should cover the meat to the edges. Preheat the oven to 450F and grease a baking sheet. Melt the butter, syrup and sugar over a gentle heat and then stir in the flour, ginger and brandy. Keep stirring for about five minutes. Drop small teaspoonsfuls onto the baking sheet, keeping them well apart. Bake for five minutes or until they are a pale golden brown. Using the greased handle of a large wooden spoon, roll the wafers round the handle while they are still hot – take care not to burn yourself! Allow to cool before eating. In a separate bowl, cream the butter and sugars with a mixer on low speed until combined, 6 to 8 minutes. Gradually mix in the vanilla and egg whites. Scrape down the sides of the bowl; continue mixing until light and fluffy. Add the flour mixture in 3 batches, alternating with the maple syrup and half-and-half, mixing after each addition and ending with flour. Mix until the ingredients are just combined; do not overmix. Fold in the bacon. Meanwhile, prepare the frosting: Beat the cream cheese and butter with a mixer on medium speed until creamy. Add the confectioners’ sugar, maple syrup and cinnamon; beat until combined. Spread on the cooled cupcakes; top with chopped bacon, if desired. *Note: While this is technically vegan, this is pretty standard pizza dough recipe. The dough will be more bread like in it’s consistency. In a large mixing bowl, combine dry ingredients and whisk together. Add yeast water and oil, and mix up until a dough forms. It will form quickly, and if you have leftover flour at the bottom of the bowl, just set it aside. Knead for 10 minutes until dough is elastic and somewhat firm. If it’s too sticky, you can add in small amounts of flour. When finished kneading, form into a tight ball. In another large, oiled bowl, place the ball and turn to coat the entire thing with a thin film of oil, then cover bowl with a damp cloth. Let rise for 1 hour, then punch down and knead for another minute, dusting with flour if necessary, until dough begins to feel less like a sponge and more like dough. Form into a ball again, place back in the bowl, and let it rest for AT LEAST 10 minutes, but really more like an hour or two. You can also freeze it and use it another time! When it’s time to make pizza, cut the dough into equal sections and roll/stretch out into shape. Preheat your oven to 500ºf, slide your pie onto a baking pan, and let it go until it’s done- 8-10 minutes.